Lugano, Switzerland April 20, 2018 – Helsinn, a Swiss pharmaceutical group focused on building quality cancer care products, today announces that the U.S. Food and Drug Administration (FDA) has approved the intravenous formulation of Akynzeo (NEPA, a fixed antiemetic combination of fosnetupitant, 235mg, and palonosetron, 0.25mg) as an alternative treatment option for patients experiencing CINV. The FDA has approved Akynzeo IV in combination with dexamethasone in adults for the prevention of acute and delayed nausea and vomiting associated with initial and repeat courses of highly emetogenic cancer chemotherapy. Akynzeo for injection has not been studied for the prevention of nausea and vomiting associated with anthracycline plus cyclophosphamide chemotherapy. Oral Akynzeo was previously approved by the FDA as a fixed combination oral agent in 2014 for the prevention of acute and delayed nausea and vomiting associated with initial and repeat courses of cancer chemotherapy, including, but not limited to, highly emetogenic chemotherapy. Akynzeo is an oral fixed combination of palonosetron and netupitant: palonosetron prevents nausea and vomiting during the acute phase and netupitant prevents nausea and vomiting during both the acute and delayed phase after cancer chemotherapy. The approval of Akynzeo in IV formulation will offer to US patients and healthcare providers an alternative route of administration of the only fixed antiemetic combination targeting two distinct CINV pathways in a single dose. Helsinn plans to launch Akynzeo in IV formulation in the US in May 2018. Akynzeo (netupitant 300mg/palonosetron 0.5mg) capsules was approved in October 2014 in the United States and is indicated in combination with dexamethasone in adults for the prevention of acute and delayed nausea and vomiting associated with initial and repeat courses of cancer chemotherapy, including, but not limited to, highly emetogenic chemotherapy. 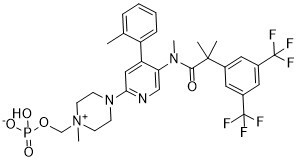 Akynzeo (fosnetupitant 235mg/palonosetron 0.25) for injection was approved in April 2018 in the United States and is indicated in combination with dexamethasone in adults for the prevention of acute and delayed nausea and vomiting associated with initial and repeat courses of highly emetogenic cancer chemotherapy.